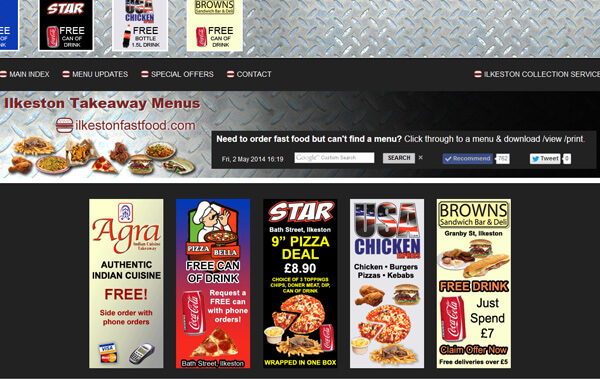 If you run a fast food outlet, cafe or eatery, how are you driving traffic to your website or other web properties? Businesses of this type typically spend on flyer/leaflet distribution so it makes sense to funnel customers to a place where they can get more info. The double sided leaflet shown below uses QR codes with Google Analytics tracking. Below the QR code is a standard printed hyperlink so customers know where the QR code is going to send them. Tantalising special offers to chaperone interested customers to the fast food web directory where the menu is viewed and telephone orders occur. Each ad space was sold for a reasonable price to cover costs and generate some profit to reinvest in the business. I personally delivered all 5000 flyers which I will explain later but first let me talk about the website. Before I started my web design company I was experimenting with search engines and local businesses. I realised fast food is something that everyone buys, every single day, but in my hometown there was no online directory where these menus could be obtained. There are 30+ takeaway businesses in my small town with thousands of pounds of turnover occurring every week. This represented an opportunity to develop a loyal local following for a local menu website. I started it in 2008 as an experiment and worked at it in my spare time. Having delivered menus myself in 2011 (market research) it is clear how expensive printing can be. A pizza place I knew paid £950 for 50,000 printed colour menus and paid me £30 for every 1000 menus I delivered to “good houses”. That was their strategy. I’m sure you’ll agree with when I say these tend to end up being thrown away by homeowners. Dishonest distributors have been known to dump the menus and pocket the cash. The point is this: those menus that do make it into the hands of interested customers need to not just sell food but pull them farther into the marketing funnel. These menus should be taking the opportunity to advertise their website or social media channels. I did this using QR codes for the local fast food directory I had set up. Despite the high traffic of the website I’d built, I knew there were still a lot of people in my town who used the internet regularly but never thought to look for local menus online. The flyer campaign was designed reach some of those customers and turn them into lifelong users of the website directory. Reaching offline potential customers is still important. If you have a mobile friendly website you’re well poised to start hitting customers in their pocket. I don’t mean their wallets, I mean their mobile phones. To use QR codes and track how many visitors are pulled into your sales funnel, you must set up tracking links using the Google Analytics URL builder. You do not want fast food flyers delivered to bungalows or elderly residential communities. I have seen menus sticking out of the letter boxes of such houses and regard it as wasteful. The elderly are the least likely to order a kebab. It’s prudent not to waste marketing materials. Be shrewd about everything. It’s one of the reasons I ended up delivering the leaflets myself. There was no one else I trusted so the planning of the route and delivery of the leaflets my lab experiment. An interesting trend I have discovered is that many orders (particularly for cheaper food such as burgers, pizza, chips and kebabs) come from the low income areas of town. The areas associated with state benefits and social housing in the poorest areas of Ilkeston accounts for the highest turnover of fast food. The average order spend is £10 – £15. You definitely want to link your offline marketing to your online marketing. Make them talk to each other. QR codes can be created online and vectorised using something like Adobe Illustrator. 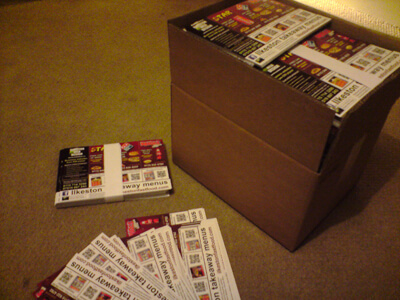 I laid out my leaflets and QR code myself in Adobe InDesign. Whatever you do, make sure to print your QR code and test it by scanning yourself with a mobile device. Don’t print a 5000 run of leaflets with defective QR codes. I talk about DIY QR codes in Photoshop here. You might want to do a test run. Generate your QR codes in high quality. Always place QR codes on a white background, otherwise they do not scan. Use the Google Analytics URL builder to create a tracking link. Plan your delivery route carefully for a round trip. I divide my maps into coloured zones. 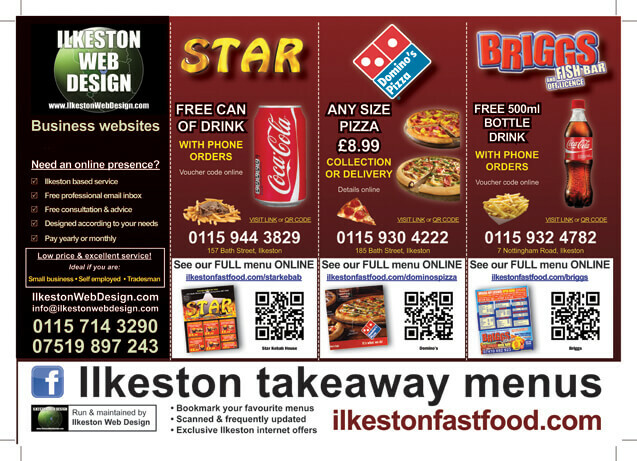 On the leaflet push any social media channels as a means of fast food customer retention. Think about how you can duplicate aspects of the idea elsewhere. 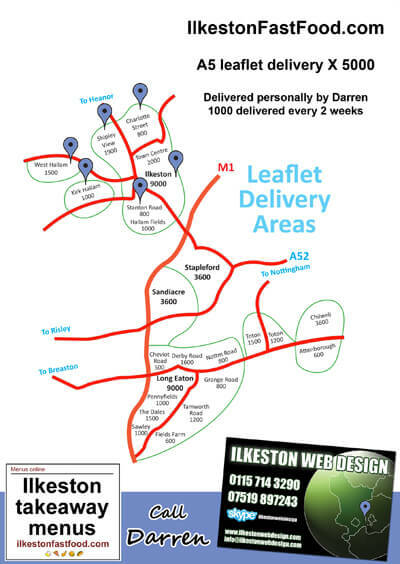 I am building more directories for nearby towns although the leafleting may remain local for now. Really QR code flyers will help to promote your website and bring real audience on website.